Welcome to North Coast Creations May Release! This month, North Coast Creations is releasing two stamp sets, Happy Camper and Ballet. Continue reading below to find out how you can win one of two North Coast Creations $10 Gift Certificates good towards the purchase of NCC Stamps. My first card uses the NCC Ballet stamp set along with the ODBD Custom Vintage Flourish Pattern Die and ODBD Custom Vintage Labels Die. I stamped the Ballet shoes in Black on White card stock, then die cut the panel using one of the label dies from the ODBD Custom Vintage Flourish Pattern Die. I stamped the Ballet shoes a second time on a scrap of MME pattern paper and paper pieced the image. The White panel is layered on a Black panel that was die cut using the ODBD Custom Vintage Labels Die. My next card features the Happy Camper stamp set. Using Eclipse tape, I masked and stamped the images using Ranger Black Archival on Watercolor paper. I added color to the images using STAEDTLER Mars Graphic Markers. I sponged clouds in the sky by sponging Blue ink around a scallop, and sponged light green ink as the grass ( a little too light since it doesn't show in the photo). I added glitter to the lights using a Spica Glitter Pen. Two randomly selected winners will each receive a $10 gift certificate to North Coast Creations, good towards the purchase of NCC stamps, just for commenting on the Design Team cards! You have until Saturday, May 17th at 10:00pm EDT to leave your comments. Winners will be posted May 18th, on the North Coast Creations Blog, so be sure to check back there to see if you are one of the winners! Great cards Lisa! Love the colors on the first and the cute little camping scene of the second! 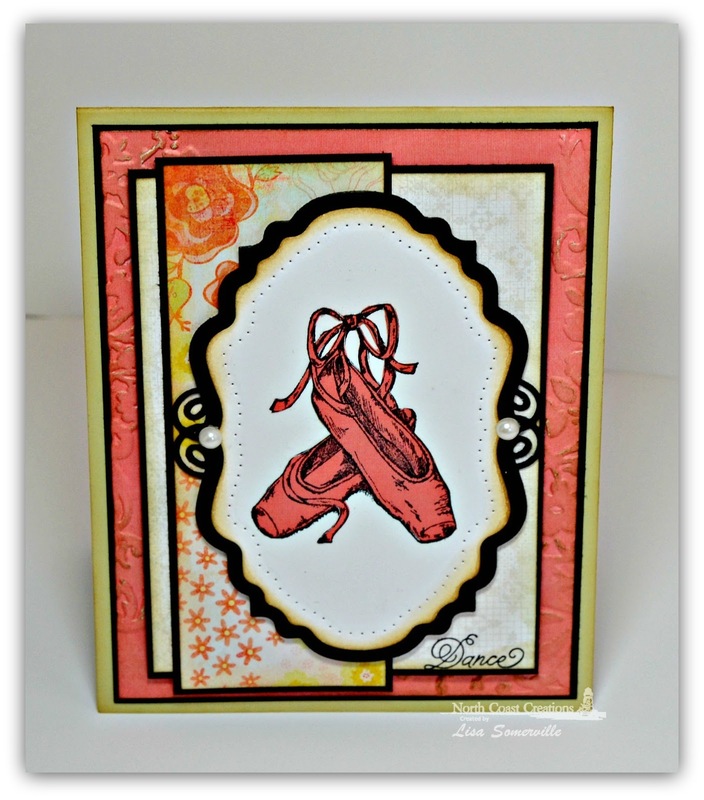 Love the coral colors of the ballet card....yummy!! Your camping card is way too cute!! HUGS!! the camping card is so cute and just love the colors on the ballet card! 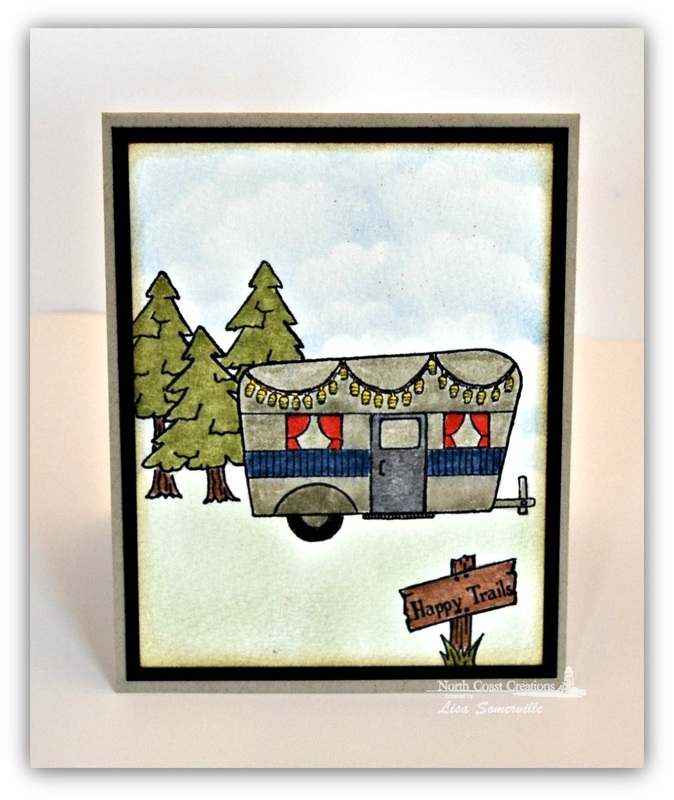 Cute camper card-using the glitter pen on the lights is a great touch. Changing up the traditional ballet colors to the coral and black gives me a great idea of how to match this idea to the colors of my granddaughter's recital costume. Thanks for the inspiration!!! Love the ballet shoes, they are just perfect in every way. so sweet, I had pale pink satin ones.....and the retro camper is a hoot, what fun! Love the coral colors on your ballet shoes!! So pretty! Fun RV camping card as well! Such fun cards, Lisa! Love the colors and papers on your ballet card and your little camper scene is so cute. Cute cards! Love the fun colors and cheerful papers!